Magnificent original and elegant features have been lovingly restored, from ornate cornices to unique marble fireplaces. Bedrooms are spacious and individually designed in traditional Indian Style. The delightful decor of each guest bedroom is enhanced by the thoughtful addition of a marble bathroom, LCD , direct dial telephone. 24 hour room service is naturally available. Whenever you find a few moment to relax, you will discover just how special we make those moments seem for you. So discover a sweet blend of diverse influences & make your stay memorable in Doon Valley with Hotel Crown Royale. Rooms are designed for the comfortable stay of an average sized family. They have everything to fulfill your accommodation needs.From Air Conditioner to Television, Direct Dial Telephones to Conference service, attentive and quick round-the-clock room service to the eye-catching decor of the rooms, everything is just perfect. All rooms are the freshly refurbished rooms that are designed to ensure an unforgettable experience to our guests. 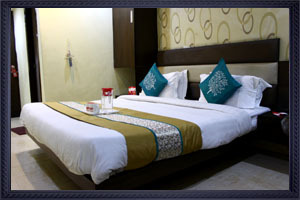 Rooms are decorated with a contemporary style ambiance & well furnished to meet high level standard.. These rooms are laid with a wide range of amenities to make you feel special as a guest. These rooms are liked by many of our guests who look for best possible expediency accompanied by luxury. We wish you a happy and relaxing stay during your spiritual quest.